Is Your Cell Blank Or Empty? Two pet peeves of mine are the way the terms [unique and distinct] and [empty and blank] are interchangeably used in Excel. They have different meanings so it’s really confusing when the name of a function or utility suggests it will do one thing when, in fact, it does the other. An empty cell can be defined as a cell that contains absolutely nothing: no constant, no formula and no prefix character. A blank cell can be defined as a cell which may be empty, or may contain a prefix character or a null string (formula result or constant). Note that the formatting is ignored. These definitions are just my own – so please don’t take them as gospel – but they’re based on the behaviour of VBA.IsEmpty() and COUNTBLANK(). Row 3 indicates what is in the corresponding column in row 4. The ISBLANK() worksheet function and VBA.IsEmpty() give exactly the same results so, unless one considers blank and empty to mean the same thing, they’re obviously inconsistently named. By my own definition, ISBLANK() should’ve been called ISEMPTY(). It’s worth mentioning that the ISBLANK() worksheet function isn’t available in VBA via the Application.WorksheetFunction class: presumably because Microsoft recognised that its functionality was already covered by VBA.IsEmpty() which is faster to call from VBA. It’s more efficient within VBA to do it this way than to call the Application.WorksheetFunction.CountBlank() method. Does A Cell Contain A Null String? If you copy that formula and paste special values then the cell will contain a constant null string. You can also sometimes get null strings when you import data from an external source, so they’re worth knowing about. The HasNullString() function below will return True if a cell contains a null string. If you want formula results to be ignored (ie. check for constants only) then pass True into the blnConstantsOnly parameter . 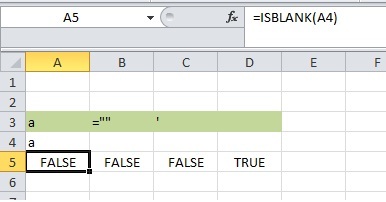 If the cell has a prefix character then the function will return False. So, am I just being an old fuddy-duddy or do these inconsistencies annoy you too? This entry was posted in Microsoft Excel, Microsoft Office and tagged blank, CountBlanks, empty, Empty String, IsBlank, IsEmpty, Null String, PrefixCharacter, VBA. Bookmark the permalink. 8 Responses to Is Your Cell Blank Or Empty? Yup, just one of many inconsistencies in Excel terminology. My understanding is that “Empty” is a VBA variant type and “Blank” is a native Excel type (xltypeNil) and they map to each other. Also a cell with only a prefix character is the same as a null string – the prefix character can be removed by clearing formats, so there’s really just the two cases to consider: True blanks and null strings. =COUNTBLANK(Rng) doesn’t distinguish the two whereas =COUNTIF(Rng,”=”) and =COUNTIF(Rng,””) do. I came across a related issue recently (http://stackoverflow.com/questions/19840989/is-there-a-function-that-would-return-when-input-ref-is-empty-and-its-conte). The question essentially asked if you can have a formula that returns an array of blanks so that the selected cell values will be ignored in formulas like MIN. Most functions like IF will convert blanks either to zeros or to null strings and i didn’t think it was possible to preserve the blank values inside arrays. But after stumbling upon an array evaluation trick on the excelxor.com blog it appears returning blanks in arrays is possible via the INDEX or CELL functions (as suggested in the latest SO response and the comment in the linked post). 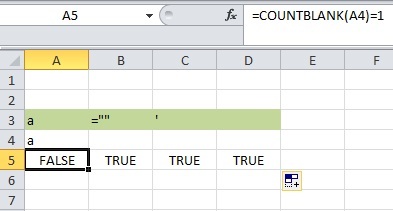 The formula extensions works absolutely fine on my 32-bit Excel 2013. I coded for 64-bit but didn’t didn’t have an available environment to test it. If you have any problems (or suggestions) then please post a comment on the post and I’ll try to help. Thanks for the post. I found it insightful. Regarding your “Is A Cell Blank?” section, if I wanted to check an entire column or entire row how would the sub or function need to be modified to account for this range instead of only a single cell? Thanks again. Great post. If I understand your question correctly, the easiest thing to do would be to use the COUNTBLANK() function? So I tried that but it’s still missing some columns that are blank all but for some null string value or prefix character. The dataset is too large to figure which cell(s) this is occurring in. I have a sheet of data that I loop through the columns from lastColumn to 1 at step -1. If the entire column is blank (like the results show for single cell in your “Is A Cell Blank?” use case), I want to delete the column. If all cells in the column are blank, empty, null string, and/or prefix character I want to delete it ultimately. It seems to me the function: IsBlank = (CStr(rngToCheck.Cells(1).Value2) = vbNullString could be modified to account for broader ranges as opposed to single cells. Thoughts? Conditional formulas treat blank cells and empty cells differently. AVERAGE(c10:c17) will ignore empty cells but AVERAGE(if(b2:b50=2005,c2:c50)) will treat them as zeros. Both formulas will ignore blank cells. I was surprised to discover this today after many years of using Excel. I am going to try this tomorrow at work with a very frustrating problem I’ve been having with a VBA project I manage, but this is the first place I’ve found a satisfactory description of the problem that I’m seeing and a possible way to work around it. I’m glad I found this. There are too damn many little inconsistencies and problems with Excel when you really get to know the program well. Thank you very much for this post.